Formula 1 keeps teasing us. The pieces have all been in place a few times already now, but fans keep being denied what we really want. Three of the past five races should have been all-out fights for victory between as many as six cars. But even if that's being optimistic - and judging by the lacklustre performances of Valtteri Bottas and Kimi Raikkonen in the Mexican Grand Prix, it probably is - the simple fact is those races should have been three-team battles. How good does that sound? It's something F1 hasn't had since the middle of 2013, after which Sebastian Vettel and Red Bull returned from the summer break and won every race to the end of that season. Mercedes then picked up where Vettel left off when the new regulations came in for 2014, and since then we have been feeding on scraps in terms of multi-team excitement at head of the field. In the V8-engine era, once refuelling was banned there were 77 races between 2010 and '13. That's the same number we've had since the V6 hybrid engines were introduced. During the first of those spells, eight drivers won races, representing six different teams. Since 2014, six drivers have won races for just three teams. But perhaps even more alarming is that 80% of those wins have been for Mercedes. Yes, Red Bull had its moments of dominance in the previous era, but even with Vettel's nine-race winning streak to close out 2013, its win percentage during that time was 52%. Thirty-six races were won by other teams while Red Bull was winning four consecutive world championships - just 15 have been won by something other than a Mercedes since 2014. How exciting could Verstappen's quest for a second F1 win have been if he'd had Vettel and Raikkonen to deal with as well in Malaysia? That's what has made some of the recent race weekends in 2017 so tantalising. Over the past five races, the gap in ultimate pace between F1's top teams is closer than it has been at any point in the V6 hybrid era - and Mercedes isn't even top of the pile! At Autosport we regularly judge the comparative pace of the cars by converting their fastest lap times over a race weekend to a percentage, with the outright fastest lap of the weekend expressed as 100%. Perhaps an easier way to think of it is to imagine adjusting every lap time to the equivalent of a 1m40s lap (100 seconds, instead of 100%) - only slightly quicker than a pole position-worthy lap of Spa. Using that logic, over the past five race weekends - Singapore, Malaysia, Japan, USA, Mexico - around our theoretical 1m40s lap Ferrari has been on average 0.075s faster than Mercedes, and 0.335s quicker than Red Bull. That data is slightly skewed by the fact that a car's quickest lap of the race weekend is almost always in qualifying, and right now Red Bull's Renault engine is no match for Mercedes or Ferrari when the power levels are turned up for Q3 on a Saturday. But when you consider that Mercedes enjoyed an advantage of at least 0.7% over its closest challenger from 2014-16, those figures from recent races paint the picture F1 and its fans have been desperate to see since the Silver Arrows' dominance became clear nearly four years ago. Mercedes finally has some proper competition. Unfortunately, that competition hasn't provided us with the thrilling racing you'd expect from such closely matched cars over the past few races, as circumstances have worked against fans' hopes on Sundays. We were robbed of a cracking Singapore Grand Prix by the multi-car start crash that eliminated both Ferraris and Max Verstappen, leaving Lewis Hamilton clear to keep Daniel Ricciardo at arm's length to take an unlikely victory around the Marina Bay streets under the lights, on one of Mercedes' least competitive weekends of the year. 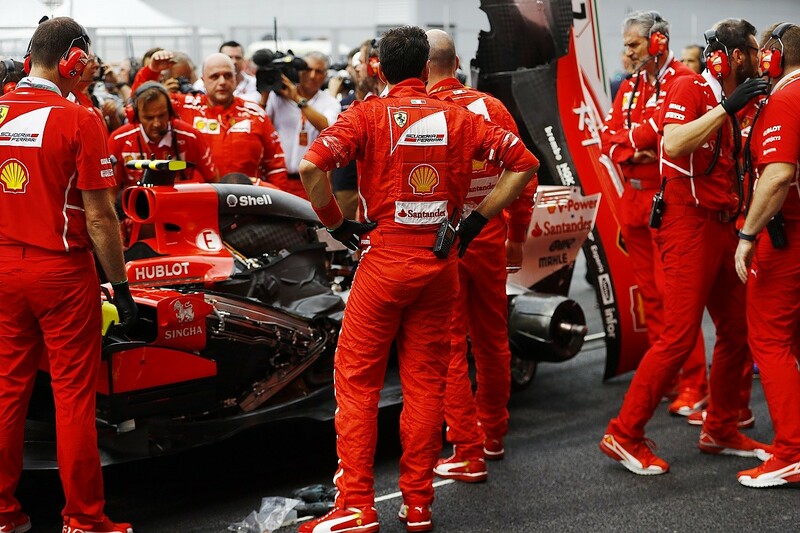 In Malaysia there was nothing between Mercedes and Ferrari on outright pace (0.050%), but both of the red cars were out of the fight for victory before the lights even went out, with engine problems striking Vettel in qualifying and front-row starter Raikkonen on the grid. Red Bull's Saturday pace was 0.516% down on Mercedes, yet in the race Verstappen turned that around to pass Hamilton for the lead early on and drive away to a clean victory - a clear indication of how big the difference can be between qualifying and race engine modes. How much more exciting could Verstappen's quest for a second F1 win have been if he'd had Vettel and Raikkonen to deal with as well? Perhaps Malaysia's final GP would have gone down as a classic. Suzuka was Mercedes territory, with Ferrari 0.540% adrift and Red Bull 1.130% back on outright pace. So while it's debatable how much of a fight anyone could have put up against Hamilton that weekend, the fact that Verstappen finished just over a second behind the world champion suggests Vettel (more than half a second quicker than Verstappen in qualifying) arguably should have been a real factor if it wasn't for a spark-plug problem from the start. Another opportunity missed. Hamilton's comprehensive beating of Vettel in a straight fight at Austin would indicate that race played out as it should have, but Red Bull's (Saturday) pace deficit in Texas was almost identical to the gap from Malaysia, and on race day at Sepang Verstappen showed how that could turn around. Unfortunately, he was forced to fight through from 16th due to grid penalties, and Ricciardo's race ended early with engine failure. The scene was set, then, for a stunning Mexican Grand Prix, with neither Mercedes able to get on the front row on merit and Ricciardo the only driver from the big three out of position on the grid due to penalties. Even Hamilton couldn't contain his excitement when watching replays of the dash to the first corner in the race, where he, Verstappen and Vettel were side-by-side contesting the lead. We should have been treated to another hour and a half of that, most likely with Verstappen and Vettel going head-to-head, and Hamilton's Mercedes for once pushed into the role of pursuit and attempted disruption, either putting in one of his all-time great drives to stay in the mix, or trying something different strategically to make life difficult for those ahead of him - as we saw from Verstappen late on at Austin. Instead, 23 seconds into the 71-lap race, Vettel had front-wing damage and Hamilton's right-rear tyre was deflating, leaving Verstappen in the clear to take a second win in three races. It was a comfortable, masterful drive from the Red Bull man, but it won't go down as memorable for anything other than Hamilton's "horrible way" to win a championship as he and Vettel battled back through the field, and the Ferrari was unable to get the second place required to keep the title race alive. Five races, five opportunities missed. The good thing is that at least the fundamentals are in place for the first time in this era of F1: we genuinely have three evenly matched cars at last, with different strengths and weaknesses meaning the competitive picture can change from race to race. Grid penalties aside, the circumstances that continue to deny us an all-out fight between three teams are so varied that it can surely be only a matter of time before we get to see Mercedes v Ferrari v Red Bull play out properly on track. Verstappen's victories have prompted hopeful talk of a thrilling 2018 fight, but as the data shows, there's no reason we should have to wait that long. The 2018 picture is even more tantalising when McLaren is added to the mix. There has been plenty of talk, pretty much all from Fernando Alonso and the team itself, that the MCL32 chassis is one of, if not the best on the grid, and next year we'll find out for certain when it ditches its useless Honda engines for the same Renault power Red Bull will be using. There will be nowhere to hide, and hopefully from a neutral fan's perspective, McLaren will make good on all the talk and we'll be treated to a four-team championship battle. They say good things come to those who wait. Mercedes deserves a lot of praise for the way it has dominated this era of F1, but even team boss Toto Wolff accepts that closer competition is better for everyone. Let's hope for something that was worth waiting more than four years for when everything finally comes together - whether that's in the next two races or, more importantly, from the start of next season.